In celebration of World Vegetarian Awareness Month, this week’s meal plan is meat-free! Going vegetarian or vegan can seem like a drastic life change, but as many Greenling customers can attest, it can be an easy way to include more fruits and vegetables in your diet and cut down on food costs. For the latter reason, I have been trying to include at least three meatless meals in our weekly menu plans, and I have seen a slight decrease in my overall grocery budget. This is definitely a work in progress, and I’d love any feedback or ideas that you have for going meatless or sticking to a grocery budget. Here’s what’s coming in this week’s Local Box. Meal one: Fuyu persimmons taste great while they are firm, or as they ripen and get soft. You can eat them alone, but the ones coming this week look pretty small to work as a side dish on their own. I’m planning to use them along with the lettuce in this Salad of fall greens with persimmons and hazelnuts. I’ll sautee some zucchini in olive oil and sprinkle a few minced garlic chives over the top for a side dish. Meal two: Squash, onion and bell pepper fajitas, Margarita’s tortillas, vegetarian refried beans on the side. Meal three: Sweet potato burritos. This is a new recipe for me, but it looks like a wonderful way to use the pound of sweet potatoes we’re getting from Gundermann this week, along with an onion and the leftover tortillas from meal two. I will snip a few tablespoons of garlic chives into the burrito filling, too, for added flavor. For dessert, apple slices dipped in easy caramel sauce. Meal four: This pear butternut squash soup looks wonderfully comforting, and it uses coconut milk, one of my favorite dairy substitutes for savory/sweet flavor profiles. A sweet yellow onion will make a fine replacement for the leek in that recipe, and if I have extra mashed sweet potato on hand from the burritos, I’ll sub that for the butternut squash in the recipe. We’ll round out the meal with a few slices of toast, some more sauteed zucchini with garlic chives, plus apple slices and caramel sauce if there’s any left from meal three. Wednesday: This Okra and tomato soup only needs a little time to come together, like a quick version of gumbo. We’ll have sliced peaches and southern soda bread on the side. Thursday: Goat cheese and a peppery vinaigrette offset sweet melon in this Savory Canteloupe Salad, served with crusty bread. If traditional cubed melon is more to your taste, skip the salad dressing and use the goat cheese for a grilled cheese sandwich on the side. Friday: Butternut squash macaroni and cheese, sliced peaches. Saturday: We’re having chicken or vegetable fajitas, and instead of regular guacamole, I’m going to try this Texas mosh salad with avocado and purple hull peas. I bet the peas will really complement the creamy avocado, and the smoky flavor of grilled fajitas. Sunday: Looks like there are a lot of shallots in the Local Box, enough for this Shallot and white wine poached salmon, served with garlic red potatoes. Monday: Slow cooker pot roast, garlic red potatoes. I just heard a clap of thunder outside! As I write this, I’m doing a little rain dance in my office and hoping that we get some moisture this afternoon. It will take a lot more than a few showers to get real relief from the heat, but like most of Austin, I’d be happy for anything at this point. Wednesday: We’re going meatless with fresh pinto beans with tomatoes and blueberry quesadillas for dessert. I’ll use a few chopped basil leaves in place of the cinnamon on the quesadillas. Thursday: Summer squash tacos, cilantro cucumber salad, and Cucumber-Basil mojitos. Use the yellow-skinned Indian cucumber in the salad and save the pretty green Armenian cucumber for the drinks. Armenian cucumbers are actually a member of the muskmelon family, so they are slightly sweeter than regular cucumbers and particularly well suited for cocktails. Friday: Potato chickpea curry, basmati rice and mango lassi. Saturday: If I can stand to turn my oven on in this heat, I’ll roast a whole chicken using this Lemon Basil Roast Chicken recipe and serve sliced peaches and blueberries on the side, along with some biscuits. If I don’t feel like turning on the oven, I’ll stick the chicken in the slow cooker and use the lemons and basil to make basil lemonade. Sunday: I’ll use our eggplants, tomatoes and beef to make Tortma Stew, an Arabic one-dish recipe and serve it with Pita Bread, sliced raw peppers and Hummus. If we have any of the cucumbers left, I’ll slice those up and dip them in the hummus, along with the pepper slices. Monday: I’ll use the leftover pita bread to make these onion pita pizzas and serve it with sliced peaches on the side. Lemon Thyme Marinade, Spicy Sweet Potato & Quinoa Salad and more! Super delish recipes this week! These savory breakfast bites evolved from a Crustless Zucchini Pie recipe I found on allrecipes.com a few months ago, and they have become one of my favorite healthy snacks. 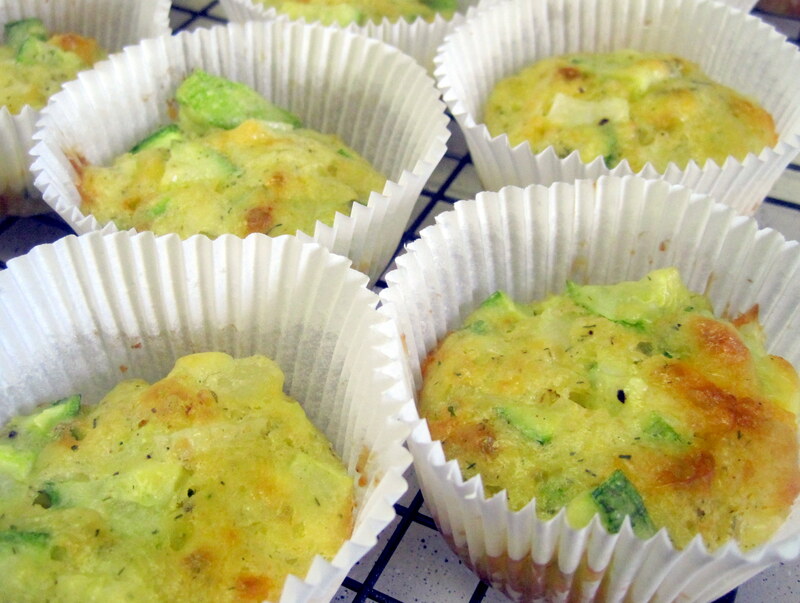 Although they look like muffins, their texture is similar to firm quiche. I like to make a big batch of these on Sunday night and store them in the fridge for on-the-go breakfasts during the week. This recipe freezes well, too, so it’s a good way to use up extra summer squash. If you prefer a casserole to these portable muffins, use two 9-inch pie plates and increase the baking time to 35 minutes. Grate squash with a hand grater or food processor. Put shredded squash in a potato ricer to drain out as much liquid as possible. No potato ricer? Let the squash sit in a mesh strainer for half an hour before proceeding. Preheat oven to 350 degrees and prepare muffin tins with paper liners. (Don’t skip this– these will stick to muffin tins and make your life miserable.) Beat 4 eggs in a large mixing bowl. Add remaining ingredients and stir until well combined. Divide batter evenly between 24 muffin cups and bake in preheated oven for 20 minutes, until muffins are firm and golden brown. Remove from oven and cool breakfast bites on wire racks. Store completely cooled breakfast bites in an airtight plastic bag in the fridge for up to a week. *Either regular or gluten free baking mix work well here. We’re actually going to be in Napa and Sonoma this weekend, so we won’t be getting a Local Box from Greenling this week. But I still have a few ideas for ways to use this week’s box contents, so I thought I would share them anyway. This week, we’re getting cucumber melon and lettuce from Bluebonnet Hydroponics; eggplant and long beans from Animal Farm; canary melon, edamame and a variety of peppers from Tecalote; Texan pears and black-eyed peas from Lightsey Farms; basil or herbs from Pure Luck; shallots from Lundgren; and okra from Naegelin. I’m bummed we won’t be getting a box, but I can’t say that we won’t be eating and drinking well!